Fonseca Cosacos | Old Morris Tobacconist Victoria BC, Fine Cigars, Humidores and Tobacco Merchantile. 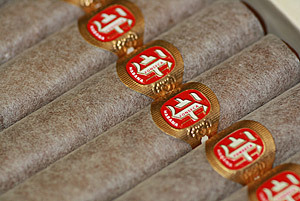 Welcome to a mild and copacetic blend of herbaceous flavours, expertly wedded to subtle and un-intrusive tobacco taste. Reconnect with your inner king–this perfectly executed light cigar will crown you cool with its cutting-edge levels of fresh and relaxing with smooth-paced burn.